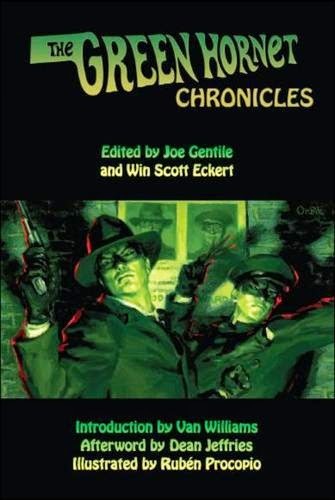 All three of Moonstone's Green Hornet anthologies have stories with crossovers in them. Several stories reference the Hornet's genealogical relationship to the Lone Ranger. Win's stories in the first and third volumes feature the insidious green-eyed Chinese doctor Shan Ming Fu, who is best known by another name, and his granddaughter Isabella Fang, who is also the daughter of the titular villain from the radio series Doctor Fang. (Shan Ming Fu and Isabella also appear in Win and Matthew Baugh's Honey West/T.H.E. Cat crossover novel A Girl and Her Cat, incidentally.) Matthew Baugh's stories in all three volumes feature Tim Nektosha of the Potawatomi tribe, a relative of Tonto, and his girlfriend Hanomah Return, a relative of Manly Wade Wellman's Native American detective David Return. There are other crossovers in the anthologies as well. 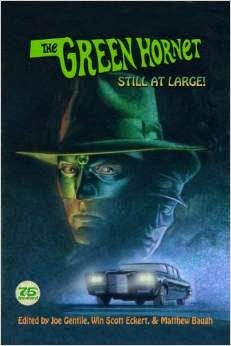 It's worth noting that the hardcover edition of The Green Hornet: Still At Large! 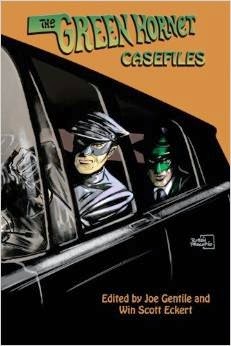 features a story by Michael Uslan in which the radio version of the Hornet meets the Avenger. Besides an appearance by Britt Reid's elderly great-uncle John, the story also has veiled references to Doc Savage and the Shadow.